The White Mountains and surrounding areas offer a wide diversity of habitats, from juniper grassland to spruce-fir forest. Nesting species in the higher elevation mixed conifer and spruce-fir forests include Gray Jay, Blue Grouse, and Three-toed Woodpecker. Lower areas near Eagar and Springerville often attract interesting migrants in the late summer and fall, as well as some sought-after nesting species such as Gray Catbird and Pinyon Jay. The area's many lakes offer habitat for nesting, migratory, and wintering populations of many species of waterfowl and bald eagles. Birding can be good throughout the year in the White Mountain area. Be advised that the higher elevations are usually impassable due to snow until May. The Map below is a zone map offering you information regarding birding in Arizona's White Mountains. Simply click on the zone of interest to navigate to narratives regarding the area in question. Click here for an area highway map. Zone 2 (Salmon): Round Valley and Greer. 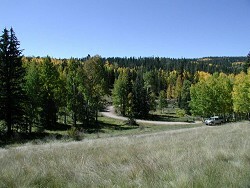 Includes Wenima Wildlife Area, Becker Lake, South Fork, Greer, Green's Peak (117), Road 273 to Gabaldon Campground. Zone 4 (Blue): White Mountain Apache Tribal lands. Zone 5 (Yellow): National Forest from Pinetop to Heber. Includes: Fool Hollow, Pintail Lake, Big Springs, and Woodland Lake. Lyman Lake State Park. The park is located on Highway 180 about 11 miles south of St, Johns and 20 miles north of Springerville. PLEASE NOTE that due to state budget concerns, open/closed status of the park should be checked prior to visiting. A fee is required for day use and overnight camping. The best birding here is during migration and winter. It is a popular boating lake in the summer. This lake has been known to produce the occasional rarity, especially during migration. 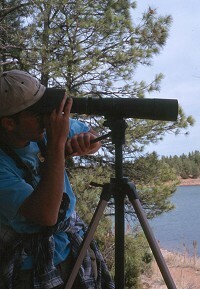 A spotting scope is very helpful for birding the lake. On the road into the ranger station, in about a quarter mile, there is a small marshy area near the left side of the road which attracts birds. In summer, look for Black Phoebe, Yellow-breasted Chat, Yellow Warbler, Virginia Rail, and swallows. Black-crowned Night-heron and other waders may also be found here in migration. A little further up the road, birding is good on the lake near the dam, where waterfowl sometimes congregate. Trees below the dam attract migrants, and Phainopepla have been seen here. In the park there are hiking trails to archeological sites. Swallows and Western Flycatcher are seen in the picnic and camping areas. A dirt road leads to the southern end of the lake, where shallow waters invite migrating shorebirds such as American Avocet, Black-necked Stilt, Greater and Lesser Yellowlegs, Long-billed Dowitcher, Snowy Egret, White-faced Ibis, and Western Sandpiper. Gulls and terns also use the lake in migration. 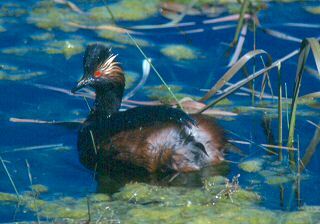 In fall through spring, Horned, Western, and Clark's Grebe can be found on the lake. Barrow's Goldeneye has been seen here. Common Mergansers, Double-Crested Cormorants, and a variety of ducks are more common. Some other birds seen in the park include Canyon Wren, Rock Wren, Canyon Towhee, Common Yellowthroat, Townsend's Solitaire, and Pinyon Jay. St. Johns Sewage Ponds and Water Street. Water Street is .1 mile east of the junction of Highway 180 and Highway 61 on Highway 61 in St. Johns. Turn north onto Water Street, and continue until it turns to dirt and you pass most of the houses at about .6 miles. From here bird the sides of the road (this is all private property), and the pastures on either side. Drainage ditches run along the pasture edges by the road and small trees growing along them provide shelter. During migration, Lazuli Buntings and various sparrows are common. Bald Eagle, Sharp-shinned Hawk, and other raptors may be present in winter. Continue traveling to the sewage treatment ponds (about 1.9 miles), and check them and the adjacent grassland from the road. A spotting scope is helpful. The sewage ponds are most interesting during migration for shorebirds, including White-faced Ibis, Long-billed Dowitcher, Spotted Sandpiper, Western Sandpiper, and Wilson's Phalarope. In the summer possible species include Cinnamon Teal, Yellow-headed Blackbird, Brewer's Blackbird, Cassin's Kingbird, Killdeer, Horned Lark, and Northern Harrier. Continue around the corner, where the road becomes known as North Water Street. Savannah, Vesper, Brewer's, Lark, and White-crowned Sparrows are often seen near the corral. Depending on the rainfall, there are sometimes floodwater channels on the right side of the road, which may have shorebirds. In summer, Blue Grosbeaks are seen here regularly. Continue birding until the road intersects a paved road (2nd West) at 2.3 miles, and turn left. Be aware of fast moving traffic on this road. Continue to a pullout on the right side of the road, which is about 3.6 miles from the start of the loop. At this marshy area listen for Virginia's Rail and Sora. Continue back into town, where the road will intersect Highway 61, which is also known as Cleveland, the main street of St. Johns. Canyon Towhee is a fairly common bird in St. Johns, seen often around barns and outbuildings in the area. Concho Lake. This lake is located in the town of Concho, just off Highway 61 south of the Bell Mart. Concho is about 25 miles northeast of Show Low and 15 miles west of the town of Saint Johns. Arizona Game and Fish Department manages a portion of this lake, although much of the shoreline is accessible to the public. This area is primarily juniper and grassland, with some cottonwoods, Russian olives, and shrubs along the shoreline. Park in the campground area, and walk either direction along the shoreline. Birding is good here at any time of year, though it is a popular fishing and picnicking spot in the summer. From fall to winter, the lake harbors abundant wintering waterfowl such as Canada Geese, Redhead, Ring-necked Duck, Common Goldeneye, Gadwall, Bufflehead, Canvasback, Northern Shoveler, and Ruddy Ducks. Common Loon is sometimes present. Also seen in winter are Bald Eagle, Phainopepla, Townsend's Solitaire, Sage Thrasher, Western and Mountain Bluebirds, and an occasional Prairie Falcon. The lake will freeze in some years, causing the birds to go elsewhere, but is often open throughout most of the winter. Fall and spring are the most productive times to visit the lake, when a wide variety of species are present. Various waterfowl, shorebirds, gulls, terns, and swallows use the lake in migration. Clark's, Western, Horned, and Eared Grebes, Double-crested Cormorants, White-faced Ibis, Common Snipe, Black-crowned Night heron, Long-billed Dowitchers, and sometimes various egrets can be seen. Migrating songbirds include Townsend's Warbler, Nashville Warbler, MacGillivray's Warbler, Cassin's and Plumbeous Vireos, Blue-Gray Gnatcatcher, Scott's Oriole, American Pipit, and Lark, Lincoln's and Savannah sparrows. In the spring, Belted Kingfisher and Osprey are usually present, and several species of flycatchers are common. Some species that nest at the lake are American Kestrel, Western Kingbird, Juniper Titmouse, Bewick's Wren, Bullock's Oriole, Yellow-headed Blackbirds, Pied-billed Grebe, and Cinnamon Teal. Petrified Forest National Park. There are two park entrances. The North Entrance is east of Holbrook on Interstate-40. The South Entrance is on Highway 180 south of Holbrook and north from St. Johns. Do not collect petrified wood in the park. An entrance fee is required. In the summer, birding at the park is best in the early morning, as the days get warm quickly and there are few trees. The wide-open grassland of the park serves as hunting grounds for a variety of raptors, such as Merlin (winter), Ferruginous and Swainson's Hawks (summer), and Great Horned Owl, Prairie Falcon and Golden Eagles (year-round). The grasslands also provide habitat year-round for Scaled Quail, Horned Lark, and Sage Thrasher. Sage Sparrows winter here and Black-throated Sparrows can be found in summer. The birding is best around the areas of Newspaper Rock and Puerco Pueblo, both of which are near the Puerco River. 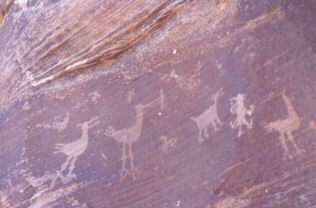 Nearby petroglyphs appear to depict long-legged shorebirds. If you park at the northern end of the parking lot at Puerco Pueblo, walk north along the park road, turning down a gravel road to the west just before the bridge. 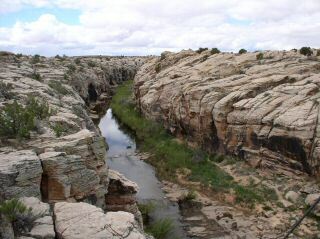 This access road follows the edge of the park near the Puerco River. Do not disturb any archeological sites. In migration several species of warblers and passerines can be found in the nearby cottonwoods and vegetation including MacGillivray's warbler, Nashville Warbler, Plumbeous Vireo, Lazuli Bunting and Western Tanager. Blue Grosbeaks, Cliff Swallows and Ash-throated Flycatchers nest in the area. Scan for soaring raptors and look over the rocky cliffs for Rock Wrens. Other birds in the park include Lark Sparrow, Western Wood-pewee, Northern Mockingbird, Loggerhead Shrike, Common Nighthawk, Blue-gray Gnatcatcher, and Eastern and Western Meadowlarks. Confluence of Silver Creek and the Little Colorado River. The confluence is located near the small town of Woodruff. The turn to Woodruff is 7.4 miles south of Holbrook on Highway 77, and approximately 20 miles north of Snowflake. Drive 5.5 miles east to Woodruff from 77 and take a right at the stop sign by the church onto Country Road. The pavement ends in about a quarter of a mile, but the dirt road is well maintained, and suitable for all vehicles. 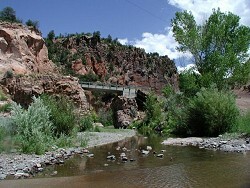 A little more than three miles down Country Road is a one-lane bridge over the Little Colorado River. Park in the dirt parking area on the right immediately after the bridge. Walk down towards Silver Creek, and bird the vegetation along the stream. Tamarisk, walnut and willows are found near the dam. Cottonwoods and wild grape grow in the steeper canyon areas. Best in migration, some of the transient species which can be found here are Spotted Sandpiper, Wilson's, Yellow, MacGillivray's, and Townsend's Warblers, Warbling Vireo, Ruby-crowned Kinglet, Green-tailed Towhee, and Empidonax flycatchers. Black Phoebe, Northern Mockingbird, and Bewick's Wren are summer residents. Golden Eagles have nested along Silver Creek. If you continue to drive Country Road, it becomes known as Old Woodruff Road and ends in about 17miles at the Snowflake-Concho highway in the town of Snowflake. Common Nighthawk and Lark Sparrow are seen here in summer, and Horned Larks are common year-round. Information in this section written by Jimmy Videle. Allen Severson Memorial Wildlife Area / Pintail Lake Known as the abbreviated "Pintail Lake," this wildlife area is actually a man-made wetland created from treated sewage wastewater, and is recognized nationally as one of the first of its kind in the country. Located on National Forest land, the area is managed by a partnership with the City of Show Low, the Arizona Game and Fish Department, the Apache/Sitgreaves National Forest, and other parties, including the White Mountain Audubon Society. From the easternmost stoplight in Show Low, which is the junction of Highways 60 and 77 and Penrod Road, go north on Highway 77 for nearly four miles to the signed turnoff for Pintail Lake. Take the dirt road east from the highway for one-half mile to the cindered parking area. A paved, fully-accessible ¼-mile trail with interpretive signs leads to a covered viewing blind overlooking the northern and westernmost ponds. Before reaching the blind, another paved trail takes off to the south, leading to a viewing deck overlooking the southernmost pond. The wetlands offer a wonderful array of waterbirds, including waterfowl such as Cinnamon Teal, Ruddy Duck, Ring-necked Duck, Gadwall, Bufflehead, American Wigeon, and, of course, Pintail. Other wetland species include Black-crowned Night Heron, White-faced Ibis, American Avocet, Black-necked Stilt, Long-billed Dowitcher (look during spring migration for groups of these species), Sora, Virginia Rail, Yellow-headed and Red-winged Blackbird, and Great Blue Heron. Keep an eye on the strategically placed snags and in the air for various raptors, which could include Bald Eagle (in winter), Red-tailed Hawk, Northern Harrier, and Prairie Falcon. Pinyon-juniper grasslands surround the wetland, offering observations of Townsend's Solitaire, Gray Vireo, Juniper Titmouse, and Mountain Chickadee. Big game species such as elk, mule deer, and pronghorn antelope may be seen in the distance, offering a different type of wildlife to enjoy. Please note that hunting is allowed in this wildlife area. Pintail Lake is popular with waterfowl hunters between November and January. Allen Severson was a local Arizona Game and Fish Department wildlife manager who perished in a light airplane crash while working to conserve wildlife for all to enjoy. The Arizona Game and Fish Department wished to remember him by naming this wildlife area in honor of this dedicated individual. To learn more about Pintail Lake and its history click here. Fool Hollow Lake State Park. One of the most recently developed Arizona State parks, Fool Hollow is on the outskirts of Show Low, managed in partnership with the Apache/Sitgreaves National Forest, Arizona State Parks, and Arizona Game and Fish Department. From downtown Show Low at the junction of Deuce of Clubs and Old Linden Road (stoplight), travel north/northwest on Old Linden Road to the signed turnoff. Or, a signed turnoff from Highway 260 on the western side of Show Low leads you to this area. As a State Park, there is a day-use fee, at times waived during the wintertime low-use visitation period. Park roads lead to two main developed areas; the east side of the lake which holds the camping/RV sites (and one fishing access point), and the west side of the lake, which offers more fishing and boating access. Habitats at Fool Hollow include ponderosa pine and juniper forests, rocky bluffs, open water, man-made waterfowl nesting islands, snags, and grasslands. There is something to offer in all seasons. In winter and during spring and fall migration periods, both sides of the lake are worth checking out. Walk the tent campsite loops and look for Mergansers and other diving ducks along the eastern arm of the lake. Bald Eagles are usually seen perched on snags on both sides of this arm. The west side fishing piers are good places to set up spotting scopes to view both dabbling and diving ducks near the southernmost end of the lake near the nesting islands. At times, Common Loon and Hooded Merganser have been sighted, along with Cinnamon Teal, Gadwall, Bufflehead, Ringed-neck Duck, Ruddy Duck, and more. Other waterbirds include Double-crested Cormorant, Great Blue Heron, Black-crowned Night Heron, Green Heron, Spotted Sandpiper, and Long-billed Dowitcher. The uplands offer Rock Wren, Dark-eyed Junco, Pygmy Nuthatch, White-breasted Nuthatch, and several woodpecker species, including Red-naped Sapsucker and Northern Flicker. Climb down the bluffs (access at the amphitheater near the tent sites) to walk the shoreline, and you may spot Canyon Wren, Belted Kingfisher, and Black Phoebe. During spring migration, check clumps of trees for migrating warblers, including Virginia's and Red-faced, as well as Warbling Vireo. Keep your eyes up as well for Northern Harrier, Osprey, Turkey Vulture, and American Kestrel; you may even see a flock of Band-tailed Pigeons. And, as mentioned earlier, a winter visit will almost definitely include Bald Eagle. Jacques Marsh. (Photo at right: "Eared Grebe" by Barbara L. Davis) From the intersection with Highways 60 and 77 in Show Low, take Penrod Road 6.5 miles (past the turn to Porter Mountain) to a right on Juniper Drive. From Highway 260 in Lakeside, turn on Porter Mountain Road (stoplight here) and Juniper Drive will be 1.5 miles on the left (past the Blue Ridge Schools and roundabout). Continue straight on this dirt road through the residential area and over a cattle guard. Follow the road as it curves around to the right and over a second cattle guard to the parking lot and information station, which is about half a mile in from the main road. Like Pintail Lake, this is a wetland that has been created from reclaimed wastewater. This area is managed by a partnership of the Arizona Game and Fish Department, the Apache-Sitgreaves National Forest, and the Pinetop-Lakeside Sanitary District. Hunting is permitted in season. The complex of ponds and marsh areas may be easily walked, although there are no maintained trails. 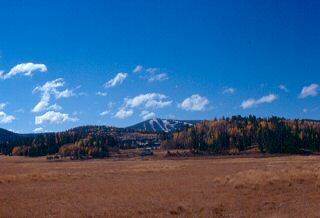 The ponds are bordered by ponderosa pine and juniper grassland. This is an excellent place to find a variety of waterfowl and wading birds. Migration brings many waders and sandpipers such as White-faced Ibis, American Avocet, Spotted Sandpiper, Long-billed Dowitcher, Wilson's Snipe, and Western Sandpiper. A few Black-necked Stilts may remain through the summer. Several species of swallows are also seen in migration such as Bank Swallow and Purple Martin. This is a good place to check for vagrants and uncommon migrants such as Black Tern. In the summer, Sora and Yellow-headed Blackbirds are common in the cattails. Some waterfowl breed in the marshes and ponds such as Pied-billed Grebe, Cinnamon Teal, Ruddy Duck, Gadwall, and Redhead. Wintering ducks include American Wigeon, Lesser Scaup, Ring-necked Duck, Northern Shoveler, Redhead, Canvasback, and Bufflehead. A variety of raptors are seen here, sometimes perched on nearby snags. 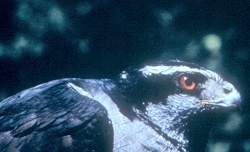 Osprey can be seen in summer and Bald Eagles in winter. Peregrine Falcons and Golden Eagles are also sometimes seen here. The open areas around the marsh and neighboring grassland provide habitat for Loggerhead Shrike, Western Kingbird, Western and Mountain Bluebirds, Northern Mockingbird, Sage Thrasher, Vesper Sparrow, Lark Sparrow, Savannah Sparrow, and Western Meadowlark. The woods that surround the ponds are also worth checking for such species as Red-naped Sapsucker, Pygmy Nuthatch, Brown Creeper, Townsend's Solitaire, and Grace's Warbler. In the late afternoon, elk are often seen coming to the ponds. For more information on Jacques Marsh, click here. Scott's Reservoir. The turnoff to the Reservoir is on Porter Mountain Road. To get there from Show Low, take Penrod Road from the intersection of Highway 77 and 60 (easternmost stoplight in Show Low) south 6.5 miles and take a left at the sign. From Lakeside, take Porter Mountain road 1.5 miles to the signed turnoff. 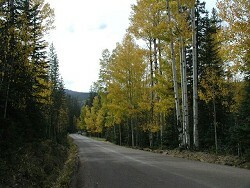 The Forest Service road is named 45C. Follow it in about a half-mile, and take the first right into the campground to the boat launch. Scott's Reservoir is accessed through the US Forest Service campground, which has boat launch facilities, bathrooms, and campsites with picnic tables, which are free for day use and camping. Bald Eagles are seen here in the winter, and waterfowl that winter on the lake include Western Grebe, Common Merganser, Northern Pintail, and Bufflehead. During the summer, Osprey and Double-crested Cormorants can be seen at the lake. However, the best birding is probably below the dam in the summertime. Although there is no maintained trail, the adventuresome will find it relatively easy to access. 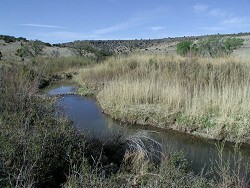 The vegetation along this stream includes cattail, willow, oak, juniper, and ponderosa pine. Some birds which may be found here are Broad-tailed and Rufous Hummingbirds, Acorn Woodpecker, Purple Martin, Violet-green Swallow, Western Wood Peewee, Mountain Chickadee, Brown Creeper, Black-headed Grosbeak, and Spotted Towhee. Another way to access the reservoir is by parking in the small lot at the Blue Ridge Cave Trail No.608 trailhead. This is on the east side of Porter Mountain Road across from the White Mountain Humane Society. Take the trail that goes down along the creek, and when the water is not too high, you can cross the creek twice and follow the trail up to the reservoir's dam. Birding is especially productive walking along the creek. In the past, Spotted Towhee, Indigo Bunting, Blue Grosbeak, Virginia's & Wilson's Warblers, Broad-Tailed Hummingbird, Western Tanager, Belted Kingfisher, Black Phoebe, House Wren, and others have been seen. Rainbow Lake. (Photo at right: "Bald Eagle" by Barbara L. Davis) Located in the town of Lakeside, this is one of the very best places to see migrating and wintering waterfowl in the area. A spotting scope is very helpful. From either Pinetop or Show Low on Hwy. 260, take Lakeview Lane (across from Lake of the Woods) south to its junction with Rainbow Lake Drive. A parking area is seen directly across Rainbow Lake Drive; park at this public access point, which is managed by the Arizona Game and Fish Department. Domesticated mallard hybrids and barnyard geese usually beg for handouts in the parking lot. Occasionally a Ross' Goose or a Greater White-fronted goose has been found among them. In the winter, Marsh Wrens and Song Sparrows skulk in the reeds. This is a good place to see Hooded Merganser in the winter, as well as Western Grebe, Double-crested Cormorant, American Wigeon, Gadwall, Green-winged Teal, Northern Pintail, Northern Shoveler, Canvasback, Redhead, Ring-necked Duck, Lesser Scaup, Common Goldeneye, Bufflehead, Common Merganser, and Bald Eagle. Unusual species like Greater Scaup, Red-breasted Merganser, and Red Phalarope have been reported here. Osprey can be seen in the summer. Back across the one-way bridge, the US Forest Service campground is a good place to try for Pygmy Nuthatches and Lewis's Woodpecker. Big Springs Environmental Study Area. 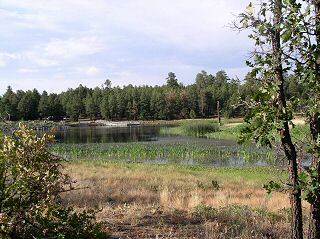 Big Springs Environmental Study Area is a piece of National Forest land in the center of the Town of Pinetop-Lakeside managed under a special use permit by the local school district for environmental education. From Highway 260 and the light at Woodland Road in Lakeside, take Woodland Road south about one-half mile to a cindered parking area on the east side. As you first walk down the path to the bridge crossing Walnut Creek, you'll notice a viewing platform and a series of interpretive signs created by the Arizona Game and Fish Department's Heritage Fund for educational purposes. As you start on the trail and cross the bridge over Walnut Creek, scan up and down the creek in the three-leaved sumacs and willows for various migrating warblers, vireos, and Ruby-crowned Kinglets. When the scarlet gilias are blooming in July and August, at times this area teems with Rufous Hummingbirds. After crossing the bridge, you come to a ½-mile loop trail. If you go straight (left fork), you'll be walking through the upland pine forest, where you can look for Red-naped Sapsucker, Northern Flicker, Pygmy Nuthatch, Mountain Chickadee, and Acorn Woodpecker. If you head to your right, you'll walk adjacent to the open meadow along the creek. Look for Belted Kingfisher, Great Blue and Green Heron, Western Bluebird, Townsend's Solitaire, Vesper and Lark sparrows, and Black Phoebe. Both halves of the trail end up at the Big Springs pond. The springs provide a constant source of warm water, so the pond is a source of open water year-round. Listen and look for Sora and Virginia Rail, many species of waterfowl, and perching Bald Eagles (winter) and Osprey (summer). A connector trail system leads from the main trail in the forested portion east to both Walnut Creek and Woodland Lake Park. Take the connector a short distance to a fork. The left fork takes you to Walnut Creek, which offers deciduous riparian habitat and is always worth a look, especially for springtime migrating warblers. The right fork leads to Woodland Lake Park, and takes you through more second-growth mid-aged ponderosa pine forest, eventually ending at a wet meadow below Woodland Lake dam. Continue past the meadow, and the trail leads up to the fishing pier access at Woodland Lake. WINTER AND FALL BIRDS - American Coot, Hooded and Common Merganser, Cinnamon Teal, Ruddy Duck, Gadwall, American Wigeon, Ring-necked Duck, Pied-billed Grebe, Mallard, Northern Shoveler, Redhead, Canvasback, Lesser Scaup, and occasionally Canada Goose and Eared Grebe. There is also the thrill of seeing Bald Eagles perched on the Lake's snags. Lewis's Woodpecker, Acorn Woodpecker, Dark-eyed Junco (Oregon and Gray-headed), and Ruby-crowned Kinglet can also be found during this time. SPRING AND SUMMER BIRDS - Common Yellowthroat, Red-winged Blackbird, Yellow-headed Blackbird, Dark-eyed Junco (Gray-headed), Chipping Sparrow, Broad-tailed Hummingbird, Rufous Hummingbird, Yellow Warbler, Lesser Goldfinch, Yellow-rumped Warbler (Audubon's), Marsh Wren, House Wren, Lewis's Woodpecker, Purple Martin, Violet-green, Barn, Northern Rough-wing, and Tree swallows, Western Tanager, Western Bluebird, Mountain Chickadee, Pygmy and White-breasted nuthatches, Brown Creeper, Turkey Vulture, American Crow, and Common Raven. Many of the birds above may be seen year-round, such as the nuthatches, Acorn Woodpecker, and Mountain Chickadee. As with all birding areas, people are drawn here because there is always the chance of seeing something new or different, and this keeps us coming back time after time. It is a good place to enjoy birding. Billy Creek Trail. Take Pinecrest Drive in Pinetop at the corner of Hwy. 260 and the Best Western hotel. Drive to the end of the road and park in the dirt by the entrance gate. This is a point of access to the White Mountains Trailsystem. Where the trail splits, stay to the left where the trail leads down to the creek through ponderosa pine and oak. Along the creek are willows and some deciduous trees. The trail continues along the stream for a while, and this is where birding is the best. This is a great walk on a warm day. Birds typical of ponderosa pine woodlands can be found here nearly year-round, including Acorn Woodpecker, Hairy Woodpecker, Steller's Jay, Brown Creeper, White-breasted Nuthatch, Pygmy Nuthatch, Mountain Chickadee, and Dark-eyed Junco. In summer, listen for Cordilleran Flycatcher, Western Wood-pewee, Red-faced Warbler, Broad-tailed Hummingbird, Band-tailed Pigeon, Purple Martin, and Grace's Warbler. 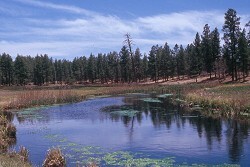 Wenima Wildlife Area was acquired by AZ Game & Fish for the water rights and to protect endangered fish. There is good birding here due to the variety of vegetation and the riparian area. Junipers and grasses cover the canyon sides. Walnut trees, wild rose, wild grape, and numerous shrubs grow at the canyon/field edges. Wenima is located about 5 miles from the stoplight in Springerville. Travel west on Highway 191/180/60 up the hill until the highways split. Take Highway 191 north (right). Turn right almost immediately (signed turnoff). Follow that dirt road about one mile. You'll veer right, down into a canyon of the Little Colorado River and into the wildlife area's parking lot. Trails extend along the river from the road. A trail on the east side of the river across the bridge, going upstream, is excellent for migrants during spring and fall. The west-side trail, following the river downstream before the bridge, takes you through willows and offers openings to the river for viewing. The edges of the fields, where they intersect with the canyon bottom, have dense vegetation and walnut trees and offer good birding opportunities. There is a small pond on the north end of the wildlife area accessed by the west-side trail; it is worth checking for Sora, the occasional Green Heron, and Black-crowned Night-Heron. Check the cliff edges for raptors. Blue Grosbeak, Indigo Bunting, and Yellow-breasted Chat nest here. Gray Catbird is a possible nester. Birding is best at Wenima in the spring, summer and fall; but it is worth visiting in the winter as well. Both Mountain and Western bluebirds utilize the junipers in the winter; Golden Eagle, and occasionally Ferruginous Hawk, hunt overhead. 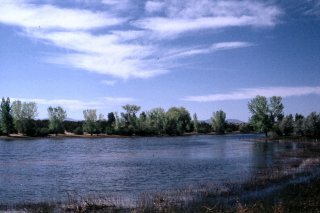 Becker Lake Wildlife Area is west of Highway 60, three miles north of the stoplight in Springerville. If you are birding Wenima first, turn left on Highway 191/180 and head back towards Springerville. Becker Lake is on the right at the bottom of the hill. Many rarities have been found at Becker Lake, particularly in the late summer/fall, but it is worth a look at any time. 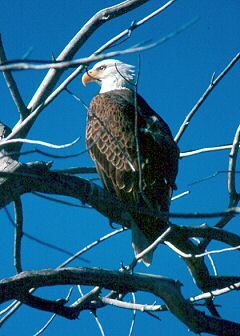 Bald eagles are present in winter. Yellow-headed and Red-winged Blackbirds nest here. Check the trees on the east side for migrants in spring and fall. Lewis's Woodpeckers sometimes nest in these trees. The South Fork of the Little Colorado River (about 5 miles west of Eagar on Highway 260, turn south) has attracted rare migrants over the years. Drive down the hill and park near the bridge. Walk up or downstream along the river. This is private property but access is allowed at this time. Do not trespass on any posted property and be cautious for vehicular traffic along this road. Gray Catbird nests here, along with Yellow-breasted Chat, Virginia's Warbler, Blue Grosbeak, and occasionally Indigo Bunting. Lazuli Buntings are possible nesters. American Dipper have nested under the bridge. Montezuma Quail are resident but difficult to see. 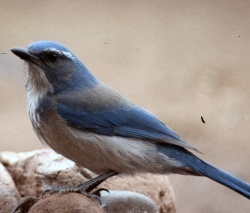 Pinyon Jay can usually be heard here. The campground (at the end of the road, parking/camping fee in summer) is a good place to bird, as is the hiking trail along the river. Red-faced, Grace's, and Yellow-rumped warblers, Plumbeous Vireo, Western Tanager, and Red-naped Sapsucker are found in the campground and along the trail. Northern Pygmy-Owl is heard occasionally. Clark's Nutcrackers and Golden-crowned Kinglets can be found in winter. The area around Greer has some of the best summer birding in the White Mountains. Osprey, American Dipper, Williamson's and Red-naped Sapsucker; Grace's, Red-faced, MacGillivray's, Virginia's and Yellow-rumped warblers; Clark's Nutcracker, Band-tailed Pigeon, Willow, Olive, and Dusky Flycatcher can be found here. Olive Warbler and Three-toed woodpeckers have been seen (rare). Travel west from Eagar on Highway 260, turn left at the Greer turnoff on Highway 373. The Benny/Rosey Creek parking area is 2.4 miles on the right (now signed as Squirrel Spring Recreation Area). Follow the old road down to the creek and bird along the short creekside trail. Look for Red-faced, MacGillivray's, and Virginia's warblers, House Wren, and woodpeckers. The upland area near the parking lot is a good place to look for Grace's Warbler, Pygmy Nuthatch, and Plumbeous Vireo. Continue south 4.1 miles on Highway 373 to County Road 1126, and turn left. Drive another .6 miles to the pulloff on the left. This is the south side of River Reservoir. Walk down the hill to the water and look for nesting Osprey and Double-Crested Cormorants in the snags along the shorline. Bird along the path on the left along the willow-lined river. Dusky Flycatcher, both sapsuckers, Grace's Warbler, Pygmy Nuthatch, and Song Sparrow can be found here. Continue on road County Road 1126 for .2 mile from the River Reservoir pullout. On the right is a 4X4 road that climbs up into an old logging area. Northern Goshawk can sometimes be seen from here. To continue birding in Greer, go back to Highway 373, turn left and drive .2 mile to East Fork Road. The Butler Canyon Nature Trail parking area is several hundred yards after the turnoff. This short trail is a good place to look for Red-faced Warbler and sapsuckers. Or you can drive/walk along the road listening for bird activity; or look for a place to access the river and walk along it. After birding here, return to Highway 373 and turn left to the village of Greer. Clark's Nutcracker and Band-tailed Pigeon are frequently found along the highway near Greer Lodge. Continue south until the road crosses a cattleguard and turns to gravel (1.8 miles). There are several parking areas along this stretch of road before it deadends in approximately 1/2 mile. Walk along the river looking for warblers and American Dipper. The East Fork Trail (accessed from the first parking area south of the cattleguard) climbs steadily before it levels out. Dusky (formerly Blue) Grouse, Northern Goshawk, and Three-toed woodpecker have been found along this trail, as well the usual montane birds. 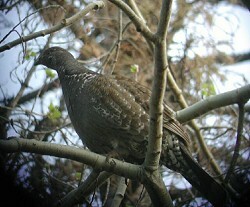 Green's Peak is the traditional place to look for the elusive Dusky (Blue) Grouse. Travel west on Highway 260 from Eagar to Forest Road 117. The mixed conifer habitat along Forest Road 117 is also good habitat for the grouse, Three-toed Woodpecker and sapsuckers. Stop anywhere where you see/hear bird activity. Beehive Spring (1.2 miles from the turnoff) is a good area to look for sapsuckers. As you continue on Forest Road 117 look for grouse on the road edges or perched on logs. Continue on Forest Road 117 until you arrive at the junction of Forest Road 61 (the left fork). Along FR 61, at the next fork, go right (straight) to Green's Peak. There is a fire lookout at the end of the road along with a plethora of communications equipment. Clark's Nutcracker, Red-breasted Nuthatch, and Golden-crowned kinglet can be found here. If you haven't found the grouse yet, a very steep, but generally cleared, path goes straight down the north face of Green's Peak. Walk this path down and check for grouse along the way. Drive back on Forest Road 61 to the Forest Road 117 intersection and go left to get to Burnt Mill Spring, which you reach in about 6 miles. White Mountain Audubon has their annual campout here. Williamson's and Red-naped Sapsuckers nest in the area. Campers (and their food) sometimes attract Gray Jay. Drive west on Highway 260 from Eagar and turn left on Highway 273, which goes past Sunrise Ski Area and Sunrise Lake on the White Mountain Apache Reservation. A pass is required if you want to bird on the Reservation. It can be purchased at the store near Sunrise Lake. Sunrise Campground is worth checking. Many waterbirds use Sunrise Lake. Savannah Sparrows are found in the short grass near the lake. Continue on Highway 273 to the National Forest boundary, where Highway 273 becomes Forest Road 113. Shortly you will arrive at a large parking lot for the Sheep Crossing recreation area. Park in the lot and walk down to the West Fork trail to Mt. Baldy, which you can access just before the road crosses the river. Walk up to the Railroad Grade trail and walk left, checking for Three-toed Woodpecker, Gray Jay, Olive Flycatcher, and both Kinglets. Lincoln's Sparrows and Orange-Crowned Warblers nest below the dam. Lee Valley Reservoir between Sheep Crossing and Gabaldon Campground can be checked for waterbirds, Osprey, and Red Crossbills. Continue on Forest Road 113 past East Baldy Trailhead to Gabaldon Campground. Gray Jays can be found in the campground or fairly close to it. The trail from the campground connects to the East Baldy Trail. Good habitat exists along the trail for Dusky Grouse and Three-toed Woodpeckers. Information in this section written by Donna Roten. Sipe White Mountain Wildlife Area is about 10 miles from Eagar. From the stoplight in Eagar, drive east on Highway 260 (the road turns south and becomes Highway 191/180). Five miles from the stoplight, at the top of the mesa, turn right at the sign for Sipe White Mountain Wildlife Area. The wildlife area is 5 miles from the turnoff on a gravel road. 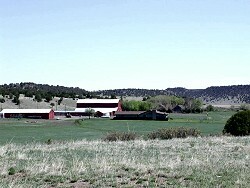 Sipe is a former ranch and has agricultural fields, grasslands, pinyon/juniper hillsides, and several reservoirs. The best birding at Sipe is along Rudd Creek and the area around the visitor's center. Sora and Cinnamon Teal can be found at the small pond near the entrance in the summer. A trail along Rudd Creek goes to the national forest boundary. You can cross the fence and follow the old road along the creek. The vegetation changes to ponderosa pine here. Typical montane species are found including: Hairy Woodpecker, White-breasted and Pygmy Nuthatch, Mountain Chickadee, and Western Tanager. Grace's and Red-faced Warbler nest in the area near the creek. Montezuma Quail have been found along this road. There are several reservoirs at Sipe. You can drive to Trinity Reservoir, where there are restrooms and a short trail to an overlook. 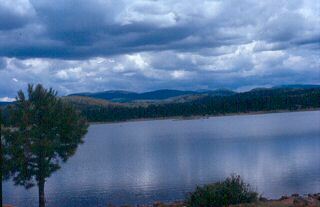 McKay is the largest reservoir. It is accessed by hiking trail. Bald Eagles (winter) and Peregrine Falcon are seen occasionally. Listen for Pinyon Jays while hiking, they are heard frequently. Restrooms and a small picnic area are at the visitor's center. The birding at Sipe Wildlife Area is best during migration. 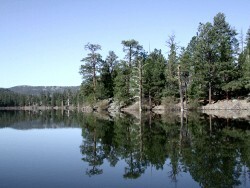 Nelson Reservoir is one of the best places to find Pinyon Jay. They roost on the east side of the road. If you are at the lake early in the morning you have the best chance of seeing them. From the light in Eagar travel 10.4 miles on Highway 260/191/180 south. Waterfowl generally congregate at the south end of the lake. Yellow-headed, Red-winged and Brewer's Blackbirds nest here. Black-crowned Night Heron, Virginia Rail, and Sora can be seen (summer). Listen for Eastern Meadowlark here as well. Road N2171 (off of Highway 191/180, south of Nelson Reservoir 1.4 miles) is another good area to check for Pinyon Jays. In the summer Vesper Sparrow, Green-tailed Towhee, Western Tanager, Black-headed Grosbeak, and various swallows are plentiful. An asphalt plant is at the end of this road, so be sure to pull completely off the road to avoid large trucks that travel back and forth. A small spring 1.25 miles from the highway is worth checking. Some small cottonwoods are attractive to migrants. You can access the east entrance to Sipe Wildlife Area by taking the first right onto a two track road. Rock and Canyon Wrens are common in the canyon. A high clearance vehicle is necessary to travel this rocky road. Nutrioso Lake (7 miles south of Nelson Reservoir) is accessed by turning right on Auger Canyon Road from Highway 191/180. The reservoir is on the west side of the highway. Warblers, nuthatches, and tanagers can be found in the pines. Pinyon Jays are occasionally heard here. Listen for their distinctive calls The lake can be full of waterfowl during migration. The post office area in Nutrioso (east of the highway) is a good place to look for Lewis's Woodpecker and sapsuckers. Nutrioso Creek south of the village of Nutrioso can be good birding. Many migrant warblers utilize the riparian resources. All this is private property, but can be birded from the road. Terry Flat is one of the most reliable places to find Three-toed Woodpecker. Travel south on Highway 191/180 about 3.5 miles past Nutrioso Lake to Forest Road 56 on the left. There is currently no sign on the highway. Travel up the road past Hulsey Lake until the split at Terry Flat loop. Take the right fork and listen for the drumming of Three-toeds along this stretch, especially near the Paddy Creek area. Near Paddy Creek there is a closed logging road. Check this road too. If you don't find them here, continue along the road stopping periodically to listen for their drumming. The road makes a loop and there are numerous old roads that can be checked as well. Dusky (Blue) Grouse, Clark's Nutcracker, Golden-crowned Kinglet, and other high altitude birds may be found along the Escudilla Mountain Trail. The trail climbs through aspen, spruce-fir, and open areas to a fire lookout. Luna Lake is near the New Mexico border, 25 miles from Eagar. Travel south on Highway191/180, go left on Highway 180 in Alpine to the lake. Bald Eagles nest across the lake from the boat launch. There is a Great Blue Heron rookery in the ponderosa pines on the south side of the highway as you look west from the parking area. Both Eastern and Western Meadowlarks are heard here. Scope the lake for waterfowl. 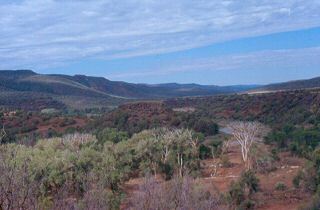 Drive to the dam (east, towards the campground). Check the outlet, particularly during migration. Walk along the San Francisco River looking in the pines for nesting Grace's and Yellow-rumped Warblers, Pygmy and White-breasted nuthatches, Hairy Woodpeckers, and the occasional Lewis's Woodpecker. The Blue River is one of the most interesting and under-birded areas in east central Arizona. The turnoff to Blue River (Forest Road 281) is at the west edge of Luna Lake on Highway 180. After climbing a small rise, the road follows the river as it drops in elevation until the road deadends at private property about 30 miles from the turnoff. Greater Pewee, Hepatic Tanager, Common Black-Hawk, Black-chinned Sparrow, Mexican Jay, Painted Redstart, Bridled Titmouse, Purple Martin, and Band-tailed Pigeon are found here (summer). Montezuma Quail, Gambel's Quail and Wild Turkey are seen occasionally. There is private property interspersed with the public land along the road, please respect it. Fort Apache Indian Reservation, covering 1.6 million acres, is home to the White Mountain Apache tribe. The Tribe encourages you to visit their land to recreate and enjoy its natural beauty, including high-elevation lakes and coniferous forests, wetlands, streams, and rivers. This reservation has one of the highest levels of biodiversity of any of Arizona's tribal lands. 1. Alchesay and William's Creek National Fish Hatcheries. The U.S. Fish and Wildlife Service manages and operates two fish hatcheries on the Reservation, and they are open to the public. Both hatcheries are located in the ponderosa pine forest type along the North Fork of the White River. Both are accessible from Hwy. 73. Visitors are welcome at both; open hours are Monday – Friday, 7:00 a.m. through 3:30 p.m. Picnic facilities, restrooms, and interpretive displays are available, and a guided hatchery tour can be pre-arranged if desired. NOTE: Since William's Creek Hatchery is located a few miles off Hwy. 73 on a dirt road, you technically need a day-use Reservation permit to drive on that dirt road. 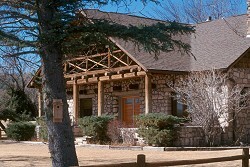 Alchesay Hatchery is located on a paved road, and a Reservation permit is not required. Contact 928-338-4901 for more information. At the hatcheries, look for riparian and forest birds such as Belted Kingfisher, Osprey (summer), Bald Eagle (winter), Great Blue Heron and other herons, Indigo and Lazuli Buntings, Yellow-breasted Chat, Brown Creeper, migrating warblers and vireos, and many other species. 2. Kinishba Ruins. 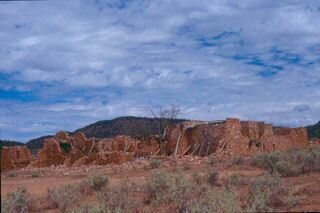 Kinishba Ruins is the remains of a village built and occupied by ancestral Pueblo people between about 1250 and 1400 A.D. The site is roughly seven road miles southwest of Whiteriver. "Kinishba" is an anglicized Apache phrase that translates to "brown house." 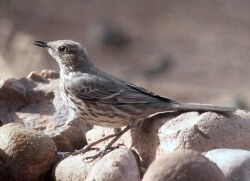 High desert, grassland, and chaparral species such as Phainopepla and a variety of sparrows can be found here. Please check with the Tribe on access. 3. Canyon Day Wash Riparian Area. Located south of Whiteriver off Hwy. 73, Canyon Day is a large riparian system worth exploring. There are few trails, and you're basically on your own to find your way around. Large cottonwoods, a healthy willow complex, and rocky bluffs and cliffs hold a variety of birds from Blue Grosbeak to Rufous-crowned Sparrow. 4. Hawley and Sunrise Lakes. Both are accessible off Hwy. 260 east of Pinetop and are high-elevation lakes. The Hawley Lake turnoff takes you about 9 miles off Hwy. 260, past the White River (a good stopping point for riparian birds) to this picturesque lake. Look for diving ducks such as Common Merganser, as well as Eared Grebe and Bald Eagle. Golden-crowned Kinglets and other high-elevation birds may be found here. Sunrise Lake is located off the highway to the Sunrise Ski Area. Look here for migrating shorebirds and waterfowl. Hon-Dah Outdoor Center and Hon-Dah Gas Station, at the junction of Hwys. 260 and 73 three miles east of Pinetop.